Title: "I will have no man in my boat," said Starbuck, "who is not afraid of a whale." Drawn in a hotel room in downtown Richmond, Virginia during the December blizzard of 2009. I will always remember that. This is beautiful!! 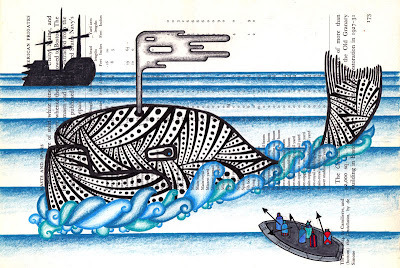 I am liking all the elements of this drawing, the frothy waters around the whale, the gradient colors of the sea. What sort of colored pencils do you use? Do you sell prints? I would buy this in a nanosecond if I could. Thank you very much Crysti, I was really happy with the way this one turned out as well. Perhaps it was the stress of being trapped by the blizzard, but I felt unusually focused while working on this. I actually have this giant tub of Berol Prismacolor colored pencils that I've been lugging around for years, so that is what I use. They come in an amazing spectrum of colors and have a wonderfully soft, waxy consistency that is perfect for bright jewel-like colors as well as more subtle gradients. Hello Dionysia and thank you for asking. I haven't yet figured out how to make good prints that I am happy with. I would like to be able to sell inexpensive yet high quality digital prints of some of the pieces, but since I use found paper and the effect of the ink and paint sometimes makes the paper a little wavy there are frequently slightly blurred areas on the scan. I am looking into ways of making some kind of digital prints though, and if I can find something I like I will post all the info here and on my site with links on how to buy. Giclée prints are pretty great. Also, a professional art-quality photo printer could help you out with the scanner issue. Thanks for considering it, and thanks for the amazing work!